The decision last week by the Islamic Society of Boston to drop its lawsuit against 17 defendants, including counterterrorism specialist Steven Emerson, gives reason to step back to consider radical Islam's legal ambitions. 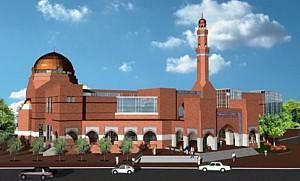 The envisioned $22 million Islamic Society of Boston Cultural Center. The lawsuit came about because, soon after ground was broken in November 2002 for the ISB's $22 million Islamic center, the media and several non-profits began asking questions about three main topics: why the ISB paid the city of Boston less than half the appraised value of the land it acquired; why a city of Boston employee, who is also an ISB board member, fund raised on the Boston taxpayer's tab for the center while traveling in the Middle East; and the ISB's connections to radical Islam. Under this barrage of criticism, the ISB in May 2005 turned tables on its critics with a lawsuit accusing them of defamation and conspiring to violate its civil rights through "a concerted, well-coordinated effort to deprive the Plaintiffs … of their basic rights of free association and the free exercise of religion." The lawsuit roiled Bostonians for two long years, and Jewish-Muslim relations in particular. The discovery process, while revealing that the defendants had engaged in routine newsgathering and political disputation, and had nothing to hide, uncovered the plaintiff's record of extremism and deception. Newly aware of its own vulnerabilities, the ISB on May 29 withdrew its lawsuit with its many complaints about "false statements," and it did so without getting a dime. The Islamist movement has two wings, one violent and one lawful, which operate apart but often reinforce each other. Their effective coordination was on display in Britain last August, when the Islamist establishment seized on the Heathrow airport plot to destroy planes over the Atlantic Ocean as an opening for it to press the Blair government for changes in policy. A similar one-two punch stifles the open discussion of Muhammad, the Koran, Islam, and Muslims. Violence causing hundreds of deaths erupted against The Satanic Verses, the Danish cartoons, and Pope Benedict, creating a climate of fear that adds muscle to lawsuits such as the ISB's. As Mr. Emerson noted when the Muslim Public Affairs Council recently threatened to sue him for supposed false statements, "Legal action has become a mainstay of radical Islamist organizations seeking to intimidate and silence their critics." Khalid bin Mahfouz v Rachel Ehrenfeld: Ehrenfeld wrote that Bin Mahfouz had financial links to Al-Qaeda and Hamas. He sued her in January 2004 in a plaintiff-friendly British court. He won by default and was awarded £30,000 and an apology. Iqbal Unus v Rita Katz: His house searched in the course of a American government operation, code-named Green Quest, Unus sued Ms Katz, a non-governmental counterterrorist expert, charging in March 2004 that she was responsible for the raid. Mr. Unus lost and had to pay Ms Katz's court costs. The Council on American-Islamic Relations began a burst of litigiousness in 2003 and announced ambitious fundraising goals for this effort. But the collapse of three lawsuits, in particular the one against Andrew Whitehead of Anti-CAIR, seems by April 2006 to have prompted a reconsideration. Frustrated in the courtroom, one CAIR staffer consoled himself that "education is superior to litigation." This retreat notwithstanding, Islamists clearly hope, as Douglas Farah notes, that lawsuits will cause researchers and analysts to "get tired of the cost and the hassle and simply shut up." Just last month, KinderUSA sued Matthew Levitt, a specialist on terrorist funding, and two organizations, for his assertion that KinderUSA funds Hamas. One must assume that Islamists are planning future legal ordeals for their critics. Which brings me to an announcement: The Middle East Forum is establishing a "Legal Project" to protect counterterror and anti-Islamist researchers and analysts. Their vital work must not be preempted by legal intimidation. In the event of litigation, they need to be armed with sufficient funding and the finest legal representation. The prospectus at www.MEForum.org/legal-project.php provides further details on this project. To join our efforts, please contact the Forum at LegalProject@MEForum.org. May 17, 2009 update: Mahdi Bray (on whom, see an IPT report) has stated his readiness to try lawfare. Here Bray speaks with Khalil Meeks of the Muslim Legal Fund of America on Bray's radio program, Crescent Report, discussing a case concerning Joe Kaufman and, more broadly, the goal of filing lawsuits to silence critics. The following transcript starts at 49:36 into the program. Mahdi Bray: In order to deal with these, these, these haters, these bashers, these Islamophobes, we've got to be willing to spend our money in a court of law, you know, and not necessarily because we're going to look for money, but we need to make, we need to be able to say we're going to spend our money and make you spend your money and you're going to stop doing this to us, I mean, I think we need to set the example. I think the situation with Joe Kaufman was an excellent example but we need to set that example all around, you know, for all of them. All of those Islamophobes - the Spencers, the, uh, Pipes, you know, and the Emersons and all that whole group. We need to make sure that we lawyer up and if they cross the line, then we need to go ahead on and take them in to, uh, legal proceedings. I think this is one way to stop this type of harassment and intimidation that goes on under the guise of protecting America, looking out, making sure that we're not infiltrated by the Fifth Column, better known as the Muslims - is crazy. Absolutely insane, and we need to put an end to it.